Beneath nickel-gray clouds that hang heavily over the hills of downtown Seattle, Archbishop Alex Brunett enters towering St. James Cathedral, his footfalls breaking the spell of a quiet afternoon. 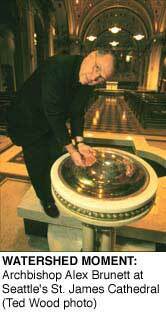 A handful of parishioners kneeling or sitting quietly in the pews glance up at their spiritual leader, who is talking in an animated fashion about a baptismal font on the floor of the church. We have walked over from his chancery office across from the cathedral because he wants to make a point about the role of water in Catholic theology. "The water isn't just sitting there," says the archbishop, gesturing toward the small pool, the water in it circulated by a pump. "We don't baptize people in stagnant water, but flowing water. Water that is alive." That belief in living water is the reason, he says, that he and seven fellow Roman Catholic bishops from Montana, Idaho, Washington, Oregon and British Columbia have spent the past three years traveling the Columbia River Basin and listening to hundreds of parishioners talk about the river, its salmon, and the economy created by the river. The result of those trips and hearings will be a rarely issued document called a pastoral letter, to be released late this year or early next. Drafts have been circulating for over a year. 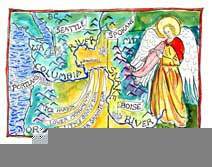 The latest version of The Columbia River Watershed: Realities and Possibilities - A Reflection in Preparation of a Pastoral Letter calls on Catholics and others to forge a new environmental and spiritual awareness about the Columbia River watershed. Catholic leaders say the letter came about because the river is in desperate straits from a century of logging, mining, grazing and dam building. Sixteen million salmon once migrated from the Pacific each year to spawn in one of the 28 tributaries along the 1,200-mile-long Columbia; now 700,000 make the journey (HCN, 12/20/99: Unleashing the Snake). "It is a gift of Creation," Brunett says of the river. "We have to use this gift, but in a way that we don't destroy it. In sermons we urge people to step up and be counted for what they believe. If we believe the river is sacred, we need to say so." "There are problems and injustices in the watershed ' Salmon, the indicator species of the life community, are becoming extinct, endangered or threatened ' Greed, ignorance, irresponsibility and abuse of economic and political power cause problems and injustices." And that's on the second page. The eight Catholic prelates in the Pacific Northwest lead 1.2 million Catholic parishioners spread over 260,000 square miles in two countries. Catholics are 25 percent of the region's total population and make up the region's largest single church. The Catholic presence goes back to the mid-19th century, when missions were among the first European settlements. Catholicism cuts across all boundaries - Indians, miners, businesspeople, Sierra Club members, loggers, irrigators, fishermen and insurance salesmen. No one has taken a poll, but it is possible that Native Americans are paying the most attention to the evolution of the pastoral letter. "Some switch has gone on; maybe God has spoken to them," jokes Donald Sampson, executive director of the Columbia River Inter-Tribal Fish Commission, a Yakama Indian and a fisheries biologist. "I hope the pope gets on board." Then Sampson grows serious. "They came into our country, and the Church was the stronghold for civilization and spreading the gospel and eliminating native religious practices and belief." Sampson's grandmother, he says, told him what happened to her in a Catholic boarding school. "If she spoke her language she was beaten. They cut her hair and made her march in line. The priests didn't want the Indian people digging roots and following fish. "Now they're saying, 'We screwed up'. The church is being up-front and dispelling the myth of Manifest Destiny and dominion over the earth. That's refreshing and welcome. But I'd like to see them call for action rather than just reflect." Sampson would especially like to see the document call for the breaching of the four Snake River dams - a position the letter does not take. If the final version of the letter in November does call for breaching, it will probably be because of Spokane Bishop William Skylstad, whom many describe as most responsible for moving the letter forward. Skylstad was asked to lead the effort by a group of lay Catholics, who in 1995 chose the Columbia River as most in need of attention (see story on page 11). He thinks they came to him "because I grew up on a tributary of the Columbia. I grew up in an apple orchard" along the Methow River in western Washington. "As a child and youth, I remember the constant roaring of the rapidly flowing river as the waters made their way to the sea." He speaks of "a sense of awe and appreciation for this wonderful gift and treasure in our midst, the flowing waters of life." But lofty religious agendas need to thread their way through the mundane politics of bureaucracy, especially one as large and multidimensional as the Roman Catholic Church. Sklystad has had to deal with the arrival of four new bishops in the region who were not originally part of the project, and not all of whom were comfortable with it. Then there is the task of pleasing people united by Catholicism but divided in every other conceivable way. "He is skilled politically in the best sense of the word," says John Hart, a professor of theology and the environment at Carroll College, in Helena, Mont. "He's well-respected, sincere and not manipulative. And when he runs a meeting he is very open to the ideas of others." Yet firm. Kirwin Werner, a Catholic who teaches science at the Salish Kootenai College in Montana, attended a meeting on the letter during which a logger harangued Skylstad at length. "Skylstad stood up to him," Werner recalls, impressed. "And when he (the logger) was done, Skylstad told him, "Well, times have changed." No one knows those changes better than the steering committee that has guided the letter's progress for the last three years. Headed by Skylstad, it is composed of representatives appointed by each bishop, as well as representatives of the region's Catholic colleges. The committee began its work, in Catholic parlance, with "a reading of the Signs of the Times." (If it had been a federal agency, it would have been called "scoping." ) Skylstad and the rest of the committee traveled to eight meetings - one per diocese - between November 1997 and February 1999. When they met at the federal research facility at the Hanford Nuclear Reservation, "We told them we didn't just want a tour, we wanted to know what was really going on," says John Reid, a leadership and organizational consultant in Seattle who is also director of the Columbia River Pastoral Letter Project. "We learned that millions of gallons of radioactive water was stored in tanks with 20-year life spans, in the 1940s, and is now leaking into the groundwater," and may spill into the river at one of its wildest places - Hanford Reach. The committee also visited Castlegar, British Columbia, where Canadian farmers were forced to sell their land decades ago to make way for the reservoirs behind U.S. dams. Now they want their land back or more compensation. And they met in Hermiston, Wash., with Indians who are for breaching the dams and farmers who are against it. They talked with migrant workers, Native American leaders, wheat farmers, and aluminum smelter workers whose jobs depend on cheap hydropower. The hearings, says steering committee member J.L. Drouhard, who works for the Justice and Peace Office in the Seattle Diocese, were instructive. "None of the bishops would have been described as an environmentalist walking into it," he says. "All of them are coming to be more environmentalist." Skylstad says he was pleased with the dialogue. "We never had any great anger," he says. "We're looking at complex decisions that have to be made. There might be sacrifices made; somehow we will do that in a collaborative way that will respect people and traditions. While there were clear and strong viewpoints, everything was done in a respectful dialogue." The meetings may have been mostly civil, but some of the behind-the-scenes politicking has been less so. Skylstad plays down the controversies, but it is clear that there were objections. "People said it was too much of a blaming document" in early drafts, Skylstad says. "Given our knowledge and expertise now, we might have made a lot of different decisions about things that were done years ago. But we tried to steer clear about taking off after certain people." After the hearings, Hart wrote a draft - the one that Skylstad says might have been too blaming - and sent it to the steering committee and to consultants in areas such as the natural sciences. Then Hart wrote another draft. This one was posted on the Web site and comments were invited, making it the first pastoral letter to use the Internet. Then a third draft was written and given to the bishops, who will revise and then release the final version this fall. Both the deliberate pace and the outreach have helped mute some opposition and have drawn others into the process. Dave Zepponi is a Catholic and director of environmental affairs for the Northwest Food Processors, a coalition of fruit, vegetable, dairy and bakery processors in the region. "I still don't know what the letter is going to look like, but it's been a useful exercise to help people focus on the deeper sense of perspective on the river system," he says. But after the second draft was posted on a church Web site, Hart received a flurry of angry e-mails and calls that accused him of "hiding behind the skirts of the bishop." And members of wise-use groups have shown up at some of the meetings, including one in Helena, Mont., and made their point - loudly. Another time, a local mining engineer came to Hart's office with his two children. For two hours he tried to convince Hart that mining was not the demon it was made out to be, pointing out that "the cathedral in Helena was built with mining money." "I told him that just because mining was beneficial to the church in the past, mining techniques are different today, and that while the church used to use asbestos to fireproof Catholic schools, it was found harmful to children and isn't used today," recalls Hart. Indeed, in the penultimate draft of the letter - A Reflection in Preparation for a Pastoral Letter - the bishops vow to reduce the use of gold in churches. The response to the letter from Catholics in the region has been mostly positive, according to project consultant Reid. "Seventy-five percent are in favor, and people are saying things like, 'I am proud to be a Catholic' and 'My God, the Catholics are dealing with the real world', says Reid. But "20 to 25 percent are saying: 'How dare you,' 'You're being duped' or 'You've been co-opted by the eco-terrorists.' "
Some environmentalists and Indians say just the opposite. They speculate that the letter's failure to call for a breaching of four dams on the Snake River means the bishops were co-opted by their more conservative parishioners. Sklystad says the letter is as strong as it can be, given the science. "We're not technical experts. We can offer spiritual reflection and offer guiding principles. We call people to good stewardship, to a sense of justice and a vision for the future. But to come down one way or the other in a technically complex area would overextend our expertise. We don't want to do something in the letter that would look silly three, four and five years down the road." Those who want the church to take a position on certain technical issues miss the point, says Frank Fromherz of the Portland Diocese's Office of Justice and Peace. "It's not a giant anvil dropped into your garden with a thud. It's an invitation to think more deeply." Supporters of the letter say that those who focus on the bishops' failure to call for dam removal miss the letter's important message: that the entire river is sacred. It calls the river and the watershed part of a "sacramental commons," and a sacrament in the Catholic definition is something that allows humans to connect with the divine. It is "a visible sign of an inward grace" according to one dictionary. Hart calls it "a moment of encounter with God." "To say the river is a sacramental commons means people can experience the Creator in creation, outside the formal church settings," he continues. It's also an important departure for the church, because it implies that a sacrament does not need to be mediated by a priest. It moves the church closer to the beliefs Native Americans in the West practiced until the Europeans - with the help of the Catholic Church - outlawed them. The tribes' religious views are an integral part of the mix of politics, science, law and faith that come together in the debate over the river. To the Umatilla, Yakama, Nez Perce and Warm Springs tribes, known as the River People, salmon have always been a sacrament, in the same way that the bread and wine of the Catholic eucharist are a sacrament. The salmon were once human, according to Indian beliefs, "and they created a place for the human beings and turned themselves into fish to provide food," says Sampson, of the Inter-Tribal Fish Commission. Each year when the first fish is caught, it is still divided among everyone in the community in the First Salmon ceremony. The tribes also believe that the treaties they signed in 1855 were a sacred guarantee. If the salmon are wiped out, the tribes claim those treaties would be violated. So they have turned to science and politics to battle for their sacred beliefs. The Columbia River Inter-Tribal Fish Commission is composed of tribal representatives who advocate the protection of estuary habitat, in-stream flows, reintroduction of salmon, and other protection and reclamation measures, "to slowly reverse the problems that got us here," Sampson says. As part of the fight for the sacred, Sampson would like to see the church support the breaching of four dams along the Snake. 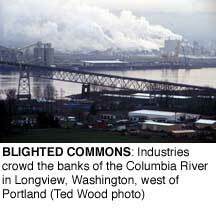 Although the draft fails to take a position on the dams or on dredging the mouth of the Columbia River to create a shipping channel, the bishops ask logging companies to remove timber in a sustainable manner, and end logging subsidized by taxpayers. They also ask that off-road vehicles and snowmobiles, which are "disruptive of forest creatures' need for habitat and humans' need for places to encounter the Presence of God in pristine creation, be confined to limited and legally constructed roads." The letter ranges beyond habitat and salmon and trees to espouse a kind of eco-friendly utopia with sustainable jobs, protection of Native American treaty rights and the fostering of viable, family-owned farms in Canada as well as in the United States. "Evils present in the watershed include racism, sexism, classism and speciesism," says the draft. "These evils are expressed in individual sin when particular persons express these evils; communal sin when a community is permeated by them; and structural sin when social systems and institutions - political, economic, educational or religious - embody them." Such shifts in church teachings will not be easy for everyone. "It's more difficult for some than others, more difficult for people oriented toward what the church has said in the past," says Hart. "It's probably easier for people who look at the social context and apply tradition, rather than people who take tradition and apply it to social context." It's often said that the devil is in the details. In this case, it may be God who is - or isn't - in the details. Has the church really gotten religion about the environment? What will the church do to make sure the letter doesn't end up in a file drawer somewhere, ignored by priests and parishioners? "That the bishops are willing to do this is a significant development," says Dieter Hessel, director of the Program on Ecology, Justice and Faith, an interdenominational nonprofit group in Princeton, N.J. "How it's followed up - how rank-and-file Catholics respond - is a real question." Though Native Americans may want the pastoral letter to call for breaching the dams, they also know that a theological shift is important - if it takes hold among the region's Catholics. "It's easy to marginalize Native American religion," says Jeremy FiveCrows, a member of the Umatilla tribe and a public affairs specialist at the Inter-Tribal Fish Commission. "It's a lot harder to marginalize your own religion." The bishops are considering a committee to implement the letter at a parish level once it is completed. The church plans to create teaching documents, videos and palm cards to be handed out at church and available elsewhere, and it plans to encourage sermons at Mass. The bishops also hope to work with groups within the watersheds that make up the huge Columbia River Basin. In Montana, the pastoral letter has already inspired a coalition of unions, environmentalists and church leaders to press for a cleanup of the Clark Fork River, by hiring people to do the cleanup work at a living wage. Some critics, including Catholics, say there's a fundamental problem with the pastoral letter: It and the church refuse to deal with the issue of overpopulation. "I told the bishop the church had its head in the closet with regard to the need for population control," says Kirwin Werner, who attended a meeting conducted by Helena Bishop Robert Morlino. "We're going to have to tackle population control or it doesn't matter what kind of ecological measures we take." The bishop, he says, chastised him at the meeting for his comments. Publicly, most Catholics involved with the letter adhere to the official position: There aren't too many people; there's an unequal distribution of resources. Privately, some involved in the letter think the church's position on birth control undercuts any major environmental statement the church makes. It remains to be seen if the church's shift on the environment will lead to the much larger shift on population. Yet the environmental shift demonstrated in the latest pastoral letter draft is enormous. Not so long ago, Christianity was targeted as the cause of ecological problems. The most famous attack came in 1967, when Lynn White Jr., a historian at the University of California at Los Angeles, published "The historical roots of our ecological crisis' in the journal, Science. He argued that the dogma and world view of Judeo-Christian tradition made humanity arrogant. "Man named all the animals, thus establishing his dominance over them," White wrote, interpreting the book of Genesis, the first book of the Bible. "God planned all of this explicitly for man's benefit and rule: No item in the physical creation had any purpose save to serve man's purpose ... Christianity is the most anthropocentric religion the world has seen." This philosophical framework set the needs and wants of man above all else and allowed science and technology free rein, which caused great damage to the natural world, White concluded. "Christianity," he wrote "bears a huge burden of guilt." Ideas are powerful, and as environmental problems have become more obvious, the environmental movement has gained great influence over the last three decades, just as organized religion was seeing its influence wane. Billed as an effort to reclaim a river, the pastoral letter may also be an effort by the Catholic Church to reclaim its relevance. "It's not meant to resolve questions, but to point out the importance of this great river," said Archbishop Brunett. "People say, 'Stay in church where you belong,' but that's not what we've been called to be. We're trying to establish a sacredness in the world around us." Freelancer Jim Robbins lives in Helena, Mont., where he writes about the West for the New York Times and others. Robbins' new book, A Symphony in the Brain: The Evolution of the New Brain Wave Biofeedback, was published in May by Atlantic Monthly Press. Jeremy FiveCrows, Columbia River Inter-Tribal Fish Commission, 503/731-1275. A copy of the document in English or Spanish can be downloaded from www.columbiariver.org.